If you are worried about your work environment being too dull and would like some ideas to liven up your commercial property then you need look no further, these are the top 10 wackiest office designs. Google has a reputation for offering a weird and unique work environment. Their UK office was designed by PENSON who decided the best thing to do was use as many bright colours as possible. As such, the walls are adorned with brightly painted Union Jacks, just in case you forget where you are, while other rooms feature fake grass and chairs that look out through walls of glass onto a bright pool. 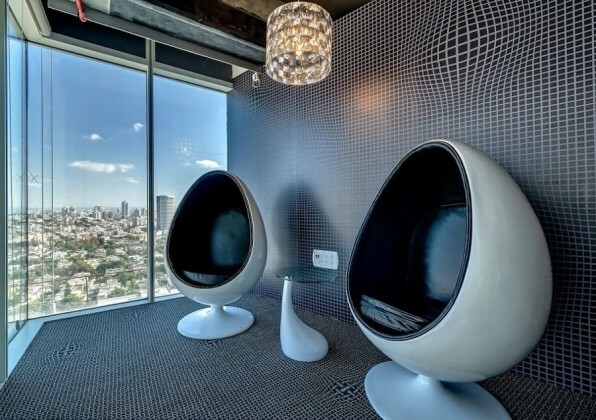 This office space was inspired by the Skype theme. So, as one might expect, it is filled with sky blue furniture and weird lighting. By weird lighting, we mean that it is used to represent the logo with little cloud shapes throughout the space. By its name, White Mountain sounds like it should be located high up. However, this office is actually located 100 feet below ground. The office is more reminiscent of the lair of a supervillain with glittering cave walls and chrome and glass interiors. This architectural company has decided that the inspiration of nature is the key to success. So, their office is located in the Spanish woodland and it is sunk into the ground by half a storey. Half of the section above ground is made of glass so one only has to look up for a breath-taking view. The Twitter offices take full advantage of their company’s role by making heavy use of @ symbols and flying birds in its decoration. It is a testament to contemporary simplicity utilising bright pastel colours for a beautiful workspace. The decoration in Hyves makes it feel more like your home kitchen than a normal office. Lots of long tables, high chairs and chrome is the rule here. Pallotta decided that the best way to design an office was to take a large, empty warehouse and then fill it with shipping containers to function as rooms. Many of these have had sides replaced with glass so everyone can see what you’re up to. Invention Land brings the outdoors inside through the production of 15 sets. These range from treehouses to pirate ships and all kinds of weird and wonderful environments. This is an exercise in making the mundane wonderful. They took an ordinary warehouse, left the industrial ceiling vents as is then splashed the walls in all kinds of bright and vibrant colours and found furniture to match. What is the best way to move down a floor you ask? An actual slide of course. Also, what is the best way to make a green wall behind the reception? Make it literally alive with a solid block of growing plants, but since this is Microsoft they need to grow in the shape of a computer.